All industrial companies face one simple problem day in and day out: moving raw materials, equipment, and finished goods from one place to another. Many companies employ large numbers of workers to perform repetitive tasks like loading and unloading conveyors, placing finished goods on pallets and in boxes, or tending machinery. Wouldn’t your business rather utilize these valuable people in other parts of your warehouse for more complex tasks? Cobots integrated by Robot27 provide the answer to this daily problem. Setting up a cobot to pick finished goods off a conveyor belt and place them on a pallet, for example, has many benefits. A well-programmed pick and place program allows pallets to be uniformly stacked over and over again. 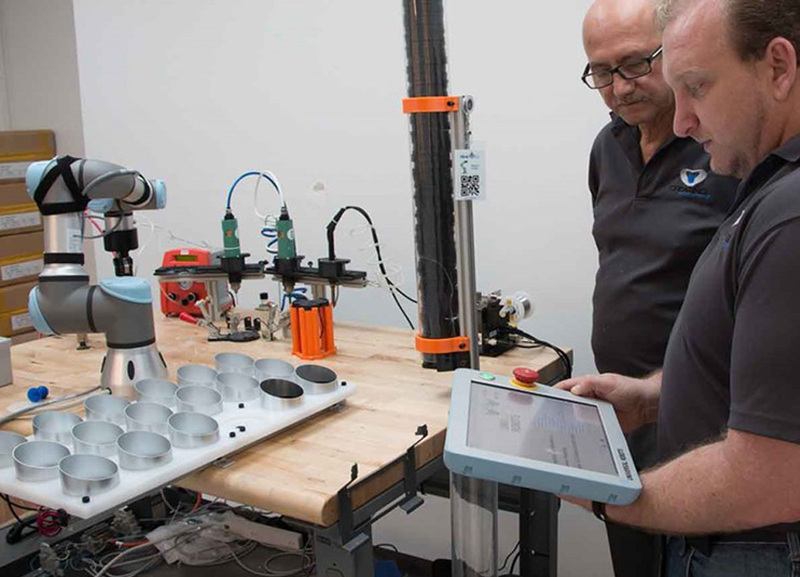 With actions capable of being repeated with deviation between movements of less than 0.1 mm over thousands of parts being placed, cobots get the job done accurately and efficiently the first time. With the assistance of a human operator, finished goods can quickly be palletized and moved to another part of your warehouse with ease. From moving parts weighing up to 10 kg to precisely packing a box with small parts or goods, cobots are the answer to many part handling challenges. 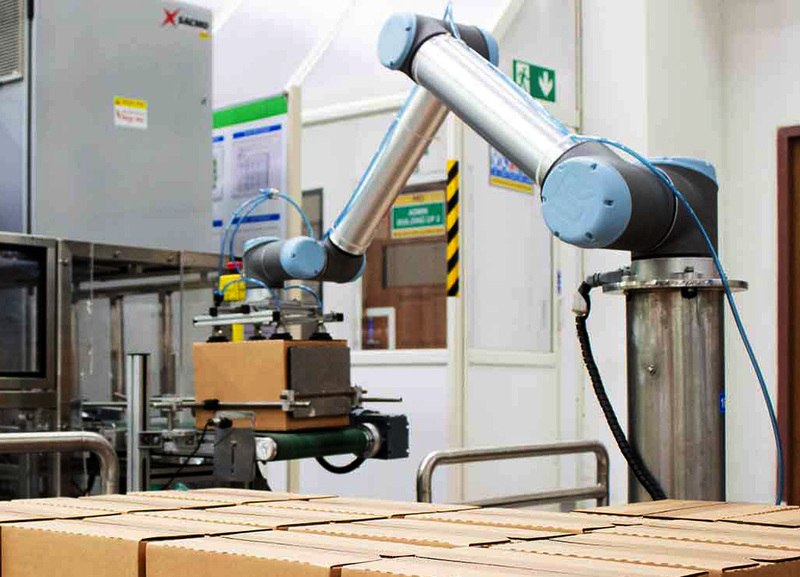 Collaborative robots relieve employees from the strenuous process of preparing bulky packages for large-scale distribution. 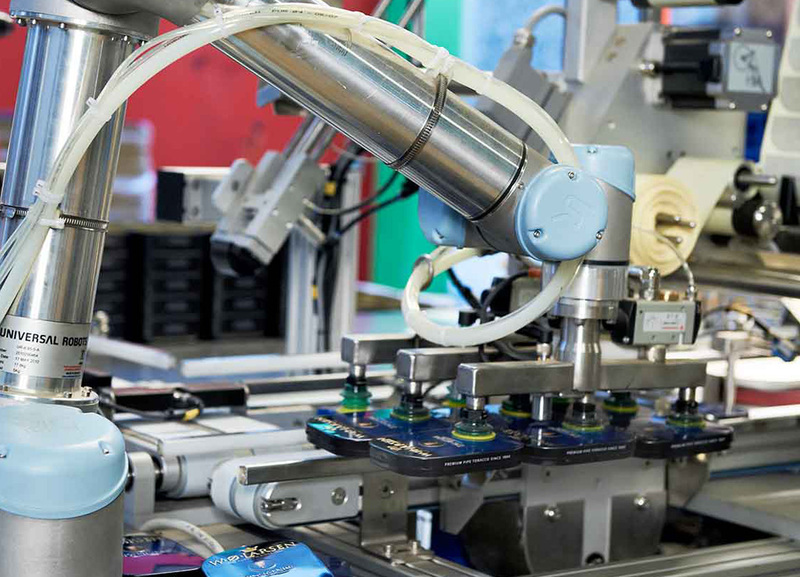 The added benefit of fenceless-operation allows the robot to work side-by-side with employees on the production lines. From moving heavy parts weighing up to 10 kg to precisely packing a box with small parts or goods, cobots are the answer to your part handling challenges. Cobots can perform precision tasks such as pre-soldering and can increase efficiency of the process almost five-fold.